Approximately 8 percent of children in the United States younger than 18 have been diagnosed with attention deficit hyperactivity disorder at some point, according to the University of Maryland Medical Center. This condition is often treated with a combination of behavioral therapy and medication, but some parents also make changes to their children's diets in hopes of improving their children's symptoms. These changes, which sometimes include avoiding chocolate, are most likely effective in only a very small percentage of children, the center says. 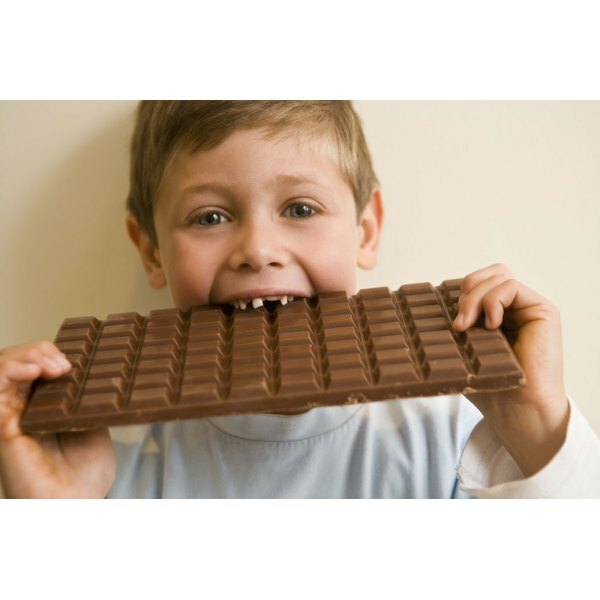 Sugary foods, including chocolate, are often blamed for hyperactivity in children. The evidence doesn't back this belief up, however, according to an article published in "Pediatrics" in February 2012. There may be a small subset of children who become more inattentive after consuming sugar, but this effect appears to be blocked as long as the children eat a food with protein before or with the food containing sugar. In general, chocolate doesn't appear to affect hyperactivity in children. A study published in "Behaviour Change" in March 2006 found that chocolate didn't affect the behavior of preschool children compared to dried fruit, which was used as a control food. A review article published in "ARYA Journal" in 2005 came to a similar conclusion, stating that none of the studies reviewed found a connection between chocolate and hyperactivity. A review article published in "Clinical Pediatrics" in April 2011 notes that a small subgroup of children with ADHD may be sensitive to artificial food colors and benefit from removing these from their diet. Of this small subset of children, between 65 and 89 percent of children had reactions when given foods containing at least 100 milligrams of artificial food colors. These children also often tend to be sensitive to certain other foods, including chocolate, and may experience fewer symptoms when they avoid these foods. The Feingold diet, which involves eliminating additives, preservatives, artificial food colors and flavors, and even some fruits that contain substances called salicylates, such as apples and grapes, may help improve the hyperactivity symptoms of some children. An elimination diet may help determine which foods to avoid. This involves temporarily eliminating foods that are more likely to cause food sensitivities, including dairy, wheat, chocolate, nuts, eggs and citrus fruits, and then reintroducing them one at a time to determine which, if any, cause hyperactivity to increase. ARYA Journal: Cacao to Cocoa to Chocolate: Healthy Food?